How To Play It: Ideally this exercise will have as many children as possible joining in, but you can also play it in a smaller pool if you only have a few people. Have everyone form into a ring lining the pool – adults too! – and start moving in one direction. If you do this for a little while, the consistent movement from everyone in the pool will create a small whirlpool that can go faster and faster. After about five minutes of this, blow a whistle and have everyone turn around and start wading in the opposite direction. They’ll be fighting against the current, getting an outstanding workout while simultaneously learning how hard it is to oppose the flow of water. How To Play It: Start by one end of the pool. Gently hold your child under their arms with them facing you, then slowly begin walking backward. After you’re moving fast enough to raise them into a front float position – this happens naturally if you’re doing it right – start spinning in a circle and encouraging them to kick their feet. Once they’re used to it, let them put their arms around your neck – this will help them get used to both the sensation of speed and the position that swimming is done in. How To Play It: Stand in the water (it should be waist to chest deep), with your legs spread wide. Your kid’s goal is to swim between your legs and emerge on the other side without touching you. New swimmers don’t always have very good directional control while underwater, games like this help them rapidly develop that particular talent. If you have several adults, challenge the child to swim through everyone’s legs in one go. How To Play It: Completely submerge your head under the water and blow out a stream of bubbles. Then, when you get to the surface, put a smile on your face and put your ear into the water to ‘listen’. You can pretend with your child to talk to sea creatures during this game, or simply practice the movements. The explanation you give isn’t important – what matters is teaching your child to be comfortable having all parts of their body underwater, and showing that you’re having fun is a key way of reassuring them. How To Play It: Place your child by either a stair or one of the walls – they’ll want to be holding onto something. Once they’re ready, start calling out the colors of a traffic light. Red Lightmeans to stop kicking and simply float there. Yellow Lightmeans to kick slowly and steadily. GreenLight means to kick as hard as they can. In addition to reinforcing traffic colors and meanings – an important part of child development all by itself – this game can teach your child to go from any speed to any other speed whenever they need to. Be sure to randomize the order of colors you call out. How To Play It: Find some small, easy-to-grab items that can sink to the bottom of the pool (some specialty stores sell toys that do exactly this). When you have some space, start tossing these items to the bottom of the pool and encouraging your child to grab them and bring them back. Be sure to time them on this and see how many they can bring back. Keep the time limit longer at first – say, three or four minutes – and slowly increase it as they grow more aquatically adept. How To Play It: Collect a large number of pool toys, ideally of different types, then place them in various parts of the pool. Each of these toys should be associated with a swimming activity of some kind, and your kid’s goal is to interact with each of them as quickly as possible. As this can test many different skills – swimming styles, diving, holding their breath, etc. – it’s best saved for when your child has learned the basics. In addition to reinforcing everything they’ve already learned, the Relay Race further enhances their ability to change what they’re doing on a moment’s notice – and when they’ve mastered this game, you can say they’ve truly become an outstanding swimmer. The upcoming festive break is a great opportunity for you and your child to spend some quality time in the pool. 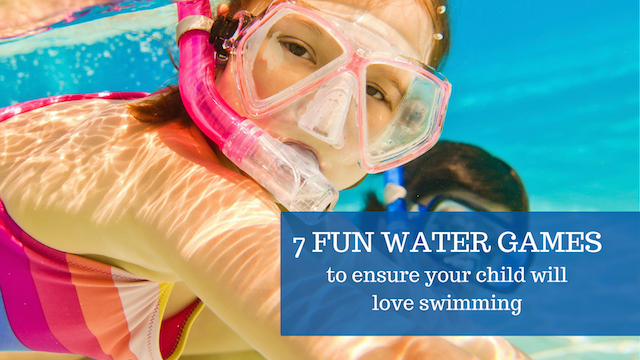 These fun and simple games can help you teach your child a love for all things aquatic. It’s a great way to introduce swimming skills in stages in addition to the weekly swimming classes. So grab your towels and let’s go!